Research has revealed a significant increase in accidents and injuries involving the driving of golf carts. Researchers from the University of Alabama at Birmingham's Centre for Injury Sciences found that there were more than 48 255 golf-cart related injuries between 2002 and 2005. A new study has also found that golf cart-related injuries jumped from 5,772 in 1990 to 13,441 in 2006. The researchers have found that popularity of golf carts has risen dramatically with these four-wheeled vehicles used beyond golf courses and becoming a mode of transportation at sporting events, hospitals, airports, national parks, college campuses, businesses and military bases. 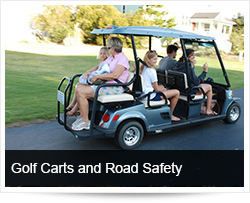 Golf carts have also become the primary means of transportation in many gated and retirement communities. The most alarming finding is that the injuries have become more common and more severe. It is estimated that nearly two-thirds of all regulation 18-hole rounds are played with golf carts and for some, especially golfers with disabilities, these vehicles are a necessity. The unsafe operation of golf carts can lead to accidents and personal injuries and the Arrive Alive road safety website has decided to address these concerns in a bit more detail. Golf carts are considered by some as toys - yet they can be rather dangerous, especially when used away from the golf course. Many communities are encouraging the use of golf carts as a primary means of transport because of their low emissions, low cost, quiet operation and presumed safety. They have become a popular way to get around in some neighbourhoods, particularly for adolescents and teenagers who cannot yet drive a motor vehicle. Safety experts have pleaded for safety standards to be implemented. It has been suggested that manufacturers and sellers of golf carts should be required to include safety education materials at the time of sale. The high risk of rollover and ejection led to the finding that the use of helmets and seatbelts be recommended, particularly if the golf cart is driven on public roads. The increase in accidents and injuries has been attributed to the growing capabilities of these vehicles and the increased speed and power. Golf cart safety not only requires safe driving but also proper maintenance of the vehicle. Brakes should be checked for proper operation. The operator needs to check for an indication of battery fluid leaks such as wet spots under the unit. Check that steering is normal. Check that forward and reverse gears are operational. Recharge the cart in the designated charging area, parking close to a fire extinguisher. Do not recharge near an open flame or source of ignition and do not smoke in recharge station. If the golf cart is in need of repairs or maintenance, the vehicle should be taken out of service. Report any damage or maintenance needs to a supervisor immediately. No modification should be done to the golf cart without the approval of the manufacturer. Never leave the keys in the golf cart when unattended. When the golf cart is not in use the operator must place the golf cart control lever in the park or neutral position, remove and secure the key and set the parking pedal brake. When the golf cart is not in use such as overnight, the cart should be secured with a chain and lock or another equivalent locking mechanism. The steering wheel must be chained to a fixed post on the cart to prevent the wheel from turning. Research studies found the highest injury rates among males aged 10 to 19 and men over 80. More than 70 percent of the injuries in which location was reported occurred at a sports or recreational facility. However, the researchers note that street injuries more often resulted in concussions and were more likely to require hospitalization than golf cart spills in other places. Nearly 40 percent of the injuries resulted from the rider falling or jumping from a golf cart, for both adults and children. The first step in golf cart safety is for both the manufacturer and the user of the equipment to be well informed. As a general guideline, it is advised that children under the age of 16 not be permitted to drive golf carts and children 6 years or younger should not be permitted in golf carts at all. Experts recommend that private and public facilities, where golf carts are allowed, should require driver's licenses and safety-operations training, as well as implement safety policies and perhaps consider golf cart safety in the design of pathways and landscapes. Unsafe operation can lead to accidents and personal injuries and can cause serious damage to the course. All passengers of a golf cart must remain seated while the cart is in motion – it is very easy to throw a standing passenger from a cart by suddenly starting or stopping the vehicle, or hitting a bump in the path or street. No one may sit in the driver’s lap while the cart is in motion – children could become crushed between the driver and the steering wheel in an accident. Young children should sit flat in the seat. Golf cart drivers should slow down when approaching other path users, curves, intersections and blind corners. Drive slowly through turns and drive straight and slow up and down slopes. Never shift gears while the golf cart is in motion. Never exceed the safe speed limit. Remember: golf cart safety is number one. Be certain to set the brake when coming to a complete stop. Operators shall not use cell phones or other means of communication while driving. Park your cart behind or beside the green, never in front, to allow players behind you to hit sooner after you've finished the hole. Avoid driving the golf car into the "approach" area 20 to 30 yards in front of the green. 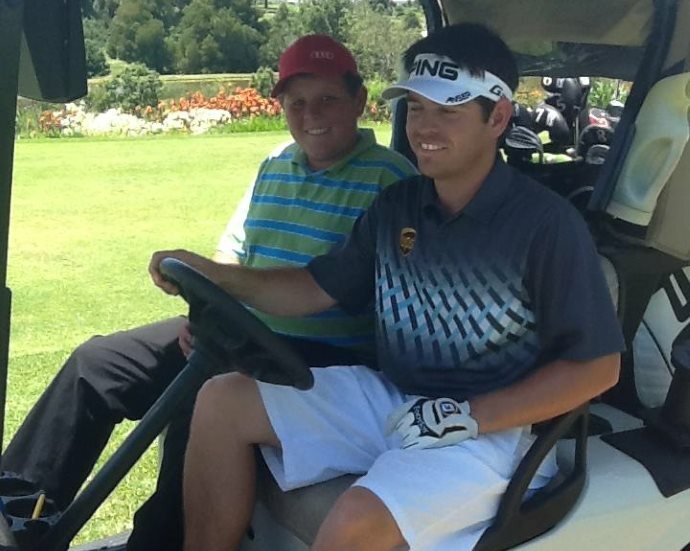 Stop your cart to avoid distracting a nearby player who is preparing to hit a shot. Never drive into yards or neighbouring properties. Never drive onto a green, collar or tee or any marked hazard. Spread out wear-and-tear by avoiding compacted areas. If carts are allowed in the fairway, follow the golf cart safety 90-degree rule: Stay on the path until you come even with your ball, then make a 90-degree turn into the fairway and drive directly to your ball. Watch for special signage or other markers that direct traffic. Avoid driving over sprinkler heads and yardage markers. All operators must abide by all traffic regulations applicable to vehicular traffic. Do not exceed the maximum safe occupancy. No golf cart is to be operated with more passengers than seating is provided. Do not exceed maximum safe speeds, particularly in areas with high pedestrian traffic - A golf cart should be operated at a speed equivalent to a well-paced walk. The maximum speed of a golf cart depends upon the terrain over which it is being driven, the weather conditions, and the total weight of the golf cart, passengers and any equipment being carried. Never back up without looking to see what is behind the cart. Golf cart drivers are required to use a horn or other audible signal when approaching pedestrians from behind - electric carts are very quiet and can injure pedestrians. Maintain adequate distance between golf cart and pedestrian. All occupants of the golf cart shall keep hands, arms, legs and feet within the confines of the golf cart at all times when the cart is in motion. Carts driven at night must be equipped with functional headlights and tail lights. Park cars in a manner that they do not impede or interfere with normal pedestrian or vehicular traffic flow on roadways, ramps or sidewalks. Do not park carts where they will block emergency equipment, pedestrian aisles, doorways or intersections. All golf carts shall display a slow moving vehicle triangle on the rear of the vehicle. Only allow towing of those golf carts originally designed for towing. May we not only Arrive Alive with our golf carts - but also arrive without injury! Regulation 5(1)(i) of the NRT Regulations does not allow golf carts to be registered. which the steering wheel is on the left hand side, excluding motor vehicles referred to in regulation 200 (2) (b), (d) and (e), shall be exempt from registration and shall not be registered in accordance with the provisions of this Part: Provided that if the ownership of a motor vehicle is to be transferred from the Department of Defence to another person, such Department shall register such motor vehicle prior to such transfer. proceeding to or from a place where repairs are to be or have been affected by such motor vehicle. (3)If a motor vehicle exempt in terms of sub-regulation (1) (c) is operated on a public road contrary to the provisions of sub-regulation (2), the title holder of such motor vehicle shall be liable for the registration thereof on the date referred to in regulation 7 (1) (a) (vii).